ARB Teak products are made from responsibly harvested grade A' teak - dried to perfection and beautifully finished. We use only the highest quality hardware made from solid brass and stainless steel, meaning no rust. Our Solid Teak Shaving Foot Rest is ideal for "wet" applications and made to withstand constant water flow. Install the practical DreamLine. folding shower seat for safety and comfort while showering. This shower seat offers you a safe place to sit, while the smart compact design takes up virtually no room. Easily fold the seat down while showering or dressing then fold it up and away for extra space when not in use. The shower seat is crafted from a durable plastic material that is pliable for added comfort. The shower seat can be installed at the height that works best for you. A shower seat is the perfect accessory for your DreamLine. shower doors, shower enclosure or shower cabin. Honey-Can-Do BTH-02100 Bamboo Spa Bench, Bamboo. Made of sturdy bamboo, this bench is the perfect accessory for any bathroom. Measuring 12.6" x 12.6" x 20", the bottom shelf has ample storage space for towels and bathroom essentials while the top tier offers seating or additional storage. Sustainable bamboo is moisture resistant and wipes clean. Assembles easily; tool is included. Shaving Foot Rest ARB Teak products are made from responsibly harvested grade A' teak - dried to perfection and beautifully finished. We use only the highest quality hardware made from solid brass and stainless steel, meaning no rust. 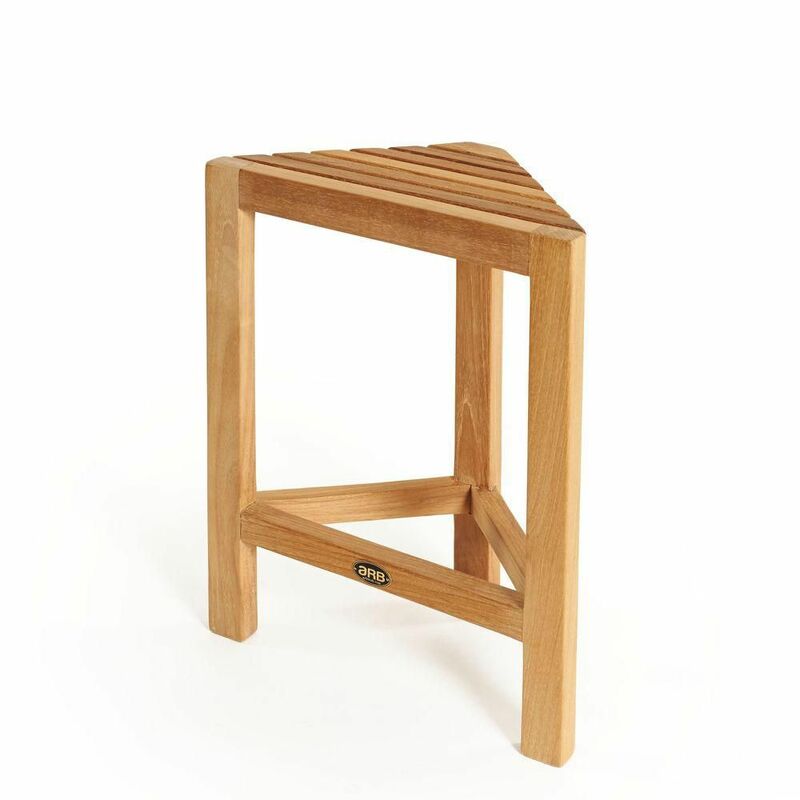 Our Solid Teak Shaving Foot Rest is ideal for "wet" applications and made to withstand constant water flow. Shaving Foot Rest is rated 4.9 out of 5 by 7. Rated 5 out of 5 by Larson from Fits perfect in our enclosed glass shower. Beautiful teak and well made. Home Depot had the bes... Fits perfect in our enclosed glass shower. Beautiful teak and well made. Home Depot had the best price! Rated 5 out of 5 by tls2pismo from Work great and appears to handle the shower water great also! Great height. Work great and appears to handle the shower water great also! Great height. Rated 5 out of 5 by Jim from Just as expected!... Just as expected! Rated 5 out of 5 by Star from It is just the perfect size to put in my... It is just the perfect size to put in my small shower. Great for shaving your legs! Rated 5 out of 5 by Bailey17 from Great little shower stool! I bought this last month for our new condo shower which is lovely but has no bench. No place to put bottles or rest my foot as needed! This little stool is perfect! Sits neatly in the corner, looks great and I can keep at least four bottles in a little metal basket I put on top which still leaves room for my foot. Perfect! Rated 4 out of 5 by mstolwyk from Exactly what I needed This shower stool is exactly what I needed in my standing shower. Works great. Rated 5 out of 5 by TonyQuin from Excellent Product Just had very serious back sugery and needed something to help me wash my legs and feet in the shower. Have been loking around and everything looked cheap and not appealing to the eye. This foot stool is amazing... very sturdy and well made no more bending to wash... Was worried it would not fit in the corner of my shower and it did! Thank you ARB Teak!! !